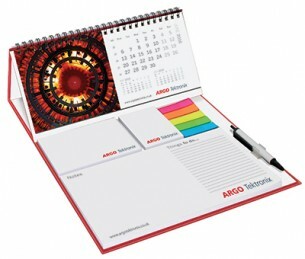 The branded Calendarpod - Wiro Deluxe has everything you could need at your desk. The self-standing month-to-view calendar also has an A7 sticky note pad with 50 sheets, an A8 sticky note pad with 50 sheets, and five index cards with 25 sheets each. On top of that, it has a 52-sheet notepad measuring 120 x 204mm, a pen clip and a pen. The perfect item for any desk worker. Your branding is printed via litho or digital printing.